HP Umpire Ron Kulpa ejected Marlins Manager Don Mattingly (Unsportsmanlike-NEC: arguing ejection non-call) in the top of the 7th inning of the Marlins-Nationals game. 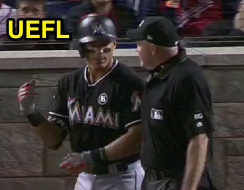 With none out and none on, Marlins batter Derek Dietrich took a 0-0 fastball from incoming Nationals pitcher Enny Romero for a hit-by-pitch. Replays indicate the pitch was located 11 inches off the inner edge of home plate and hit Dietrich on the back of the right forearm (px 1.683, pz 3.877 [sz_top 3.371]), the call was irrecusable. At the time of the ejection, the Nationals were leading, 6-2. The Nationals ultimately won the contest, 6-4. This is Ron Kulpa (46)'s first ejection of the 2017 MLB regular season. Ron Kulpa now has 2 points in the UEFL Standings (0 Previous + 2 MLB + 0 Irrecusable Call = 2). Crew Chief Jerry Meals now has 1 point in Crew Division (0 Previous + 1 Irrecusable Call = 1). Prop Bet 1) First Regular Season Ejection - Umpire: Ron Kulpa. Winner: None. Prop Bet 2) First Managerial Ejection - Manager: Don Mattingly. Winner: None. Prop Bet 3) First Regular Season Ejection - Date: April 5, 2017. Winners: BkSl14812, fvb6, Mortonkc, timjdow, Umppat, UmpsRule, wwjd220. This is the first ejection report of 2017. This is the 1st Manager ejection of 2017. This is Miami's 1st ejection of 2017, 1st in the NL East (MIA 1; ATL, NYM, PHI, WAS 0). This is Don Mattingly's first ejection since August 15, 2016 (Bill Welke; QOC = U-C [Check Swing]). This is Ron Kulpa's first ejection since May 6, 2016 (David Ortiz; QOC = N [Balls/Strikes]). Wrap: Miami Marlins vs. Washington Nationals, 4/5/17 | Videos (2x) via "Read More"